Great Sand Dunes National Park and Preserve is a United States National Park located in the San Luis Valley, in the easternmost parts of Alamosa County and Saguache County, Colorado, United States. Originally created as Great Sand Dunes National Monument on March 17, 1932, Great Sand Dunes National Park and Preserve was established by an act of the United States Congress on September 13, 2004. The park includes 44,246 acres (17,906 ha), and the preserve protects an additional 41,686 acres (16,870 ha). 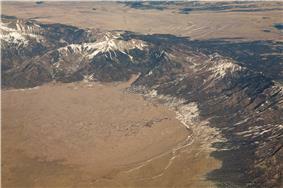 Aerial View of the Great Sand Dunes from the southwest, looking across the Sangre de Cristo Range. Winter 2015, a dry year. 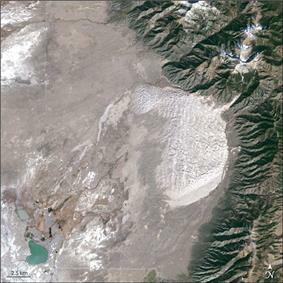 The park contains the tallest sand dunes in North America, rising about 750 feet (230 m) from the floor of the San Luis Valley on the western base of the Sangre de Cristo Range, covering about 19,000 acres (7,700 ha). Researchers say that the dunes started forming less than 440,000 years ago. The dunes were formed from sand and soil deposits of the Rio Grande and its tributaries, flowing through the San Luis Valley. Over the ages, glaciers feeding the river and the vast lake that existed upon the valley melted, and the waters evaporated. Westerly winds picked up sand particles from the lake and river flood plain. 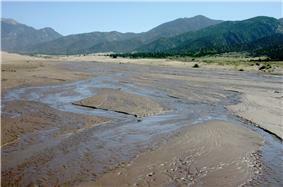 As the wind lost power before crossing the Sangre de Cristo Range, the sand was deposited on the east edge of the valley. This process continues, and the dunes are slowly growing. The wind changes the shape of the dunes daily. Digging a couple inches into the dunes even at their peaks reveals wet sand. Part of the motivation of turning the Monument into a National Park was the extra protection of the water, which Colorado's cities and agriculture covet. It is very easy to experience the dune-building process. This is a very windy region, as hikers on the Sand Dunes will attest, as on many days they will be pelted by sand and even small rocks when hiking on the dunes. The wind carries sand and rocks from many miles away. While the dunes don't change location or size that often, there are still parabolic dunes that start in the sand sheet, the outer area around the dunes, and migrate towards the main dune field. Sometimes they join the main dune field, and sometimes they will get covered with grass and vegetation and remain where they are. The dunes are relatively stable, however their morphology changes slightly with the seasons. The direction of the wind greatly affects the dune type. The winds normally go from southwest to northeast, however during the late summer months, the wind direction reverses causing reversing dunes. This wind regime is part of the reason why the dunes are so tall. The dunes contain areas of black sand which are deposits of magnetite, a crystalline black oxide of iron. The Great Sand Dunes sit on a large area of "High Desert" land in the San Luis Valley, just west of the Sangre De Cristo Mountains. The summer temperatures of this area are not typical of normal high desert lands although temperatures above 95 °F (35 °C) are not uncommon in July and August. The large variation between high and low temperatures are typical of the high desert climate. Low temperatures during winter nights can be exceedingly cold, with several night temperatures dropping below 0 °F (−18 °C) in the winter. Further off of the great sand dunes in this high desert valley, precipitation numbers are exceedingly low. However, precipitation is still very low on the great sand dunes, averaging just above 11 inches (280 mm) of rainfall per year. The high evaporation rates on the dunes qualify the area as desert land still, even though precipitation exceeds 10 inches (250 mm). It does snow on the dunes as well, but snowfall is usually very short-lived in the dry and sunny climate that is common in this area of Colorado. The park also contains alpine lakes and tundra, six peaks over 13,000 feet (3,940 m) in elevation, ancient spruce and pine forests, large stands of aspen and cottonwood, grasslands, and wetlands — all habitat for diverse wildlife and plant species. One of the most unusual features of the park happens at Medano Creek, which borders the east side of the dunes and is located next to the Visitor Center and Bookstore. Because fresh sand continually falls in the creek, Medano Creek never finds a permanent and stable streambed. Small underwater sand dunes that act like dams continually form and break down, and so waders in the stream see surges—which look like waves—of water flowing downstream at intervals of anywhere from just a few seconds to a minute or more. In a high-water year, these surges can be as much as a foot in height, resembling ocean waves. Building sand castles with the creek sand is a popular visitor activity, and Skimboarding is a great activity for young people to do because only an inch or two of creek depth is needed. 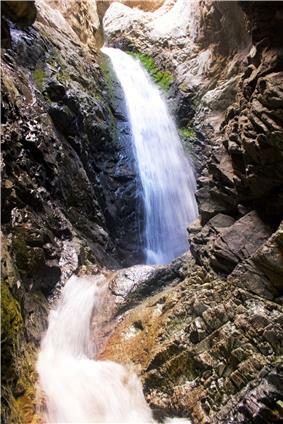 Zapata Falls is a waterfall on the southeast side of the park and requires a short hike through a small cave to access. 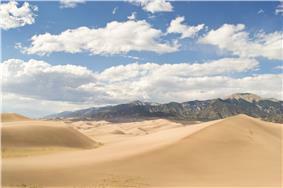 One of the most valued features of the Great Sand Dunes National Park and Preserve is one that cannot be seen. According to a recent Soundscape Study conducted by the National Park Service, this park is the quietest national park in the 48 contiguous United States. Many visitors to the site try to sled down the dunes. The Park Service provides hints as to the best time to sled (when the sand is wet) and which equipment works best. Visitors anytime other than late fall through early spring are also advised to avoid bare feet or sandals, and stick with sturdy, closed footwear. While the sand looks alluring, its chocolate color absorbs heat. The daylight sand temperature can reach 140 °F (60 °C) and will burn bare feet. There are hundreds of plant species in the park and preserve, adapted for environments as diverse as alpine tundra and warm water wetlands. Trees include douglass fir, pinyon pine, aspen, rocky mountain juniper, three-leaf sumac, bristlecone pine, and red osier dogwood. Among the flowering plants are fairy primrose, alpine aven, indian paintbrush, lousewort, blue-purple penstemon, aspen daisy, western paintbrush, elephantella, snow buttercups, Smith's draba, Scurfpea, Indian ricegrass, blowout grass, Prairie sunflower, rocky mountan beeplant, rubber rabbitbush, speargrass, small-flowered sand verbena, narrowleaf yucca, prickly pear, and ring muhly. The park harbors at least seven endemic insects: the Great Sand Dunes tiger beetle, a circus beetle, Werner's ant-like flower beetle, Triplehorn's ant-like flower beetle, an undescribed species of clown beetle, an undescribed species of noctuid moth, and an undescribed species of robber fly. Resident mammals include pikas, bighorn sheep, black bears, mountain lions, beavers, badgers, bison, and pronghorn. Over 200 species of birds are found in the park, such as the brown-capped rosy finch, red-breasted nuthatch, mountain bluebird, ptarmigan, peregrine falcon, burrowing owl, northern pygmy owl, bald eagle, golden eagle, hummingbird, and great blue heron. Various reptiles live in the park, such as the short-horned lizard, plateau lizard, many-lined skink, bullsnake, and garter snake. Resident amphibians include the tiger salamander, chorus frog, northern leopard frog, spadefoot, great plains toad, and Woodhouse's toad. Big Spring Creek is a unique spring-fed creek fed by an unconfined aquifer, creating a rare species- and plant-supporting wetlands in a generally arid area. The creek was designated a National Natural Landmark in 2012. Getting to the dunes requires walking across the wide and shallow Medano Creek, which flows only from spring to early summer. Hiking is permitted, with the warning that the sand can get very hot in the summer, up to 140 °F (60 °C). The area gets snow in the winter. Sand wheelchairs are available at the Visitor's Center. 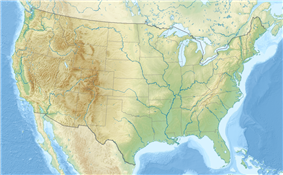 The closest city is Alamosa, though Canon City, Pueblo, Colorado Springs, Denver and Albuquerque, New Mexico are within a few hours' drive. The U.S. Post Office at Alamosa (ZIP Code 81101) serves the national park. Unlike most national parks in the lower 48 states, Great Sand Dunes National Park is equipped with a preserve which allows hunting; the preserve designation is absent from most of the lower 48. Sport hunting, which is only allowed in the preserve, is equipped with many regulations, which are available in the park's website; these regulations and laws include not pursuing a wounded animal if it enters the park or hunting inside national park boundaries. Bow-hunting is common in the preserve, and ptarmigan are frequent targets of bow-hunters. Mountain lion hunting with dogs is also allowed in the preserve, but unless the dogs have spotted the lion and are pursuing it, they are required to be leashed. The dunes — 750 feet (230 m) tall — at the base of the Sangre de Cristo Range. The dunes and surrounding area were designated a National Monument in 1932. On November 22, 2000, United States President Bill Clinton signed the Great Sand Dunes National Park and Preserve Act of 2000, aiming at ultimate national park status. With the help of the Nature Conservancy, the federal government purchased 97,000 acres (39,000 ha) of the Baca Ranch, which in effect tripled the size of the park. The purchase includes those sections of the ranch which previously bordered the park on the north and west sides and also included 14,165-foot (4,317 m) Kit Carson Mountain and 14,080-foot (4,292 m) subpeak Challenger Point, and the water drainages to the south. The land purchased was split into three sections. Part of the Sangre de Cristo Mountains would be transferred to the Rio Grande National Forest, another section to the west would be set aside as a wildlife area and would host a wild bison herd and the last section to the east would be transferred from the Rio Grande National Forest and would be open to some hunting. ^ a b "Listing of acreage as of December 31, 2011". Land Resource Division, National Park Service. Retrieved 2012-03-07. ^ "NPS Annual Recreation Visits Report". National Park Service. Retrieved 2015-06-28. ^ "The National Parks: Index 2009–2011". National Park Service. Retrieved 2012-03-07. ^ Brachfeld, Aaron (28 September 2014). "Glacial melting a danger to our civilization". Meadowlark Herald (5:39) (Meadowlark Herald). Retrieved 5 October 2014. ^ a b "Plants- Great Sand Dunes National Park and Preserve". National Park Service. Retrieved 25 September 2015. ^ "Insects and Spiders - Great Sand Dunes National Park and Preserve". National Park Service. Retrieved 17 August 2013. ^ "Mammals - Great Sand Dunes National Park and Preserve". National Park Service. Retrieved 17 August 2013. ^ "Birds - Great Sand Dunes National Park and Preserve". National Park Service. Retrieved 17 August 2013. ^ "Reptiles - Great Sand Dunes National Park and Preserve". National Park Service. Retrieved 17 August 2013. ^ "Fish - Great Sand Dunes National Park and Preserve". National Park Service. Retrieved 17 August 2013. ^ "Amphibians - Great Sand Dunes National Park and Preserve". National Park Service. Retrieved 24 September 2015. ^ "Big Spring Creek". National Park Service. June 28, 2012. Retrieved 2014-01-06. ^ "Hunting - Great Sand Dunes National Park and Preserve". National Park Service. Retrieved 17 August 2013.